Rey was born in the Dominican Republic. Rey excelled as a shortstop and second baseman. 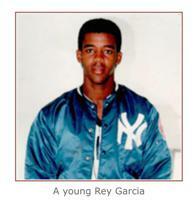 At the age of 17, the New York Yankees signed Rey as a free agent where he played for 4 seasons. Rey switched over to playing professional fastpitch softball where he played in the 2005 World Fast-Pitch Tournament in Milwaukee, and was invited to play for the US Olympic Softball Team as a shortstop. In 2006, the US team played in an International Tournament where they were awarded the Gold Medal, going undefeated. Rey was awarded the Batting Title with a .583 average. Beyond his professional playing career, for the past 15 years Rey has been a well recognized professional hitting instructor in New England working with numerous baseball and softball clients at all levels including D1 college and MLB draftees who seek Rey out for hitting instruction,Nation Wide. Garcia Hitting Academy and North East (NE) Pride Baseball & Softball is proud to be up and running in its new training facility at 577 Main Street, Hudson, MA, Suite 150. We think this location is special ! Garcia Hitting Academy focuses on baseball and softball hitting instruction, fundamentals, and advanced skills in all aspects of baseball and softball. We also stage the NE Pride Baseball & Softball teams there as well. The hitting instruction and programs for our teams and members are led by Rey Garcia.